Let me start this review by saying that I would have given this book a definite 4 stars. The why three stars, you ask? I’ll get to that as the review progresses. But to clarify, the story and the book were definitely four stars. There were a few parts of the book I did not agree with or could not believe and so, I had to deduct the one star for that. What were they? That too shall be revealed in due course. With that being said, let’s get to the review. 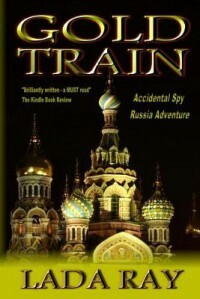 The story begins with a flashback to 1918 and the great train robbery of the entire Russian gold reserve during the revolution. It revolves around Jade Snow a reporter who begins to look into this disappearance and ends up in Russia. This is where her adventure begins. Jade finds herself in the middle of a tug-of-war between the royalists and the current government for control. In the middle of all this drama, she finds her soulmate Alexei, and a hot romance ensues. I however, did not like the fact that Jade jumps into bed with Alexei immediately, without a second thought to the loving husband and her daughter waiting for her back home. As both sides try to recruit her and make her a part of the conflict, Jade has to pick a side and this is where the situation gets dangerous. She now becomes a Russian spy and a double agent. As she races to find the gold, she gets into and out of a lot of trouble and does lose friends along the way. There are a lot of twists and turns as she tries to get all the clues together to get to the gold. After all these twists, I did feel that in the end, the mystery of finding the gold was solved too quickly and it ended up being somewhat underwhelming. This however, did not impact the adventure one bit and it continued right on. I loved the ending of the book. It clearly resolved all the issues I had. The conflict for Jade having to choose between two loves of her life was resolved quite nicely and the author was actually able to end the book on a somewhat pleasant note and without too much continuing heartbreak, while at the same time provide us a glimpse of what would be coming next. For this I would have to commend the author, as it was really nicely done. So, here’s the problem I have. I generally tend to ignore grammatical and spelling errors in most books, but upto a certain extent. However, there were some errors here where I had to go back and read the lines a couple of times to make sense of what was intended. These errors basically broke the flow of the story for me. That is something that really takes away from the pleasure of reading the book. For this, I have to deduct a star from my rating of the book. A better edited book would have been a pleasure to read as I loved the idea behind story. I, in fact loved the writing style of the author. I hope she can read this and get the book edited again, maybe bring out another “edition”. Overall, I’ll say that I quite liked the book. The story was very engaging and the characters clearly stood out for me. It could have been told without all the ‘paranormal’ in it and I would have enjoyed it more. I do believe that the tarot cards were a completely unnecessary distraction and I could have done without souls talking to each other too. I clearly have no idea why the author included these in the book as they do not add anything to the story-line. If I judge the story without any of this, it is a terrifically written thriller. I would love to read the next book in the Jade Snow series. The author does hint at the next book being set up somewhere in Asia and I can’t wait, especially as it will practically be in my backyard!